Open up the mobile app and select the Plus icon to the top right of your screen (see A). Fill in your contact's details as required (you must have at least a Organization name or a Last name to save the contact). 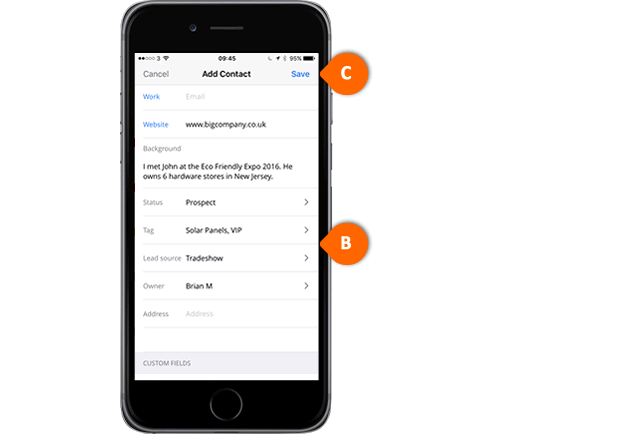 Assign a Status, any relevant Tags, Lead source and Owner to your contact (see B). Select Save to the top right of the screen (see C). 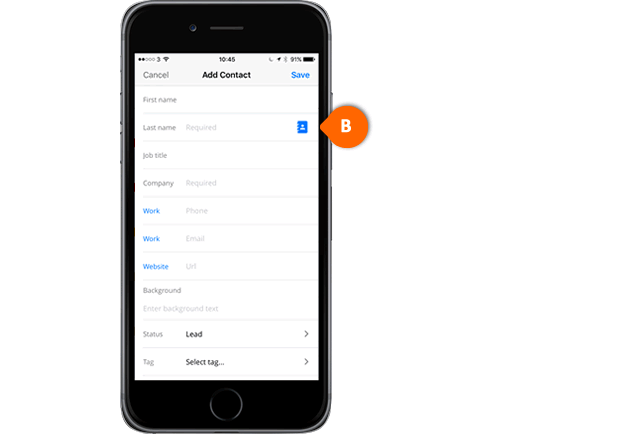 After your contact is saved, you will be prompted to enter a Next Action (see D). This is the next task to be completed to move your contact closer to a sale. Enter your Next Action text and schedule it for a date in the future. Select Save in the top right (see E). 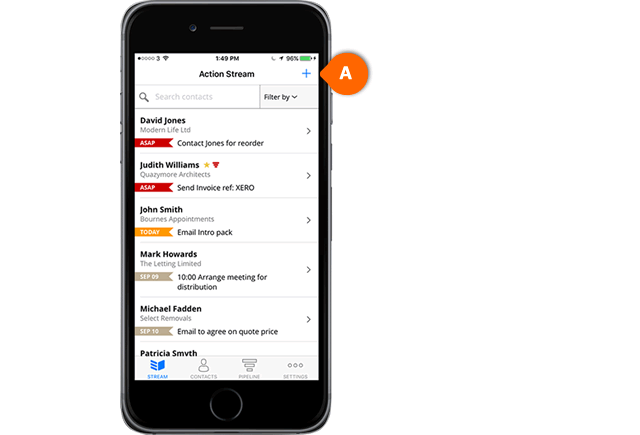 Your contact will then appear in your Action Stream and will float to the top of the list when their action falls due (see F). 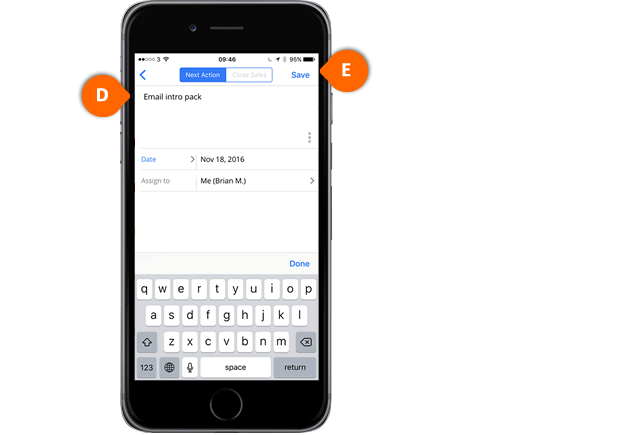 Choose the Address book icon (see B) and select your chosen contact from your address book. We'll pull their First name, Last name and Phone number into the relevant fields in OnePageCRM. Fill out the rest of the contact's information and assign a Status, any relevant Tags, Lead source and Owner as required (see C). Select Save to the top right of the screen (see D). After your contact is saved, you will be prompted to enter a Next Action (see E). 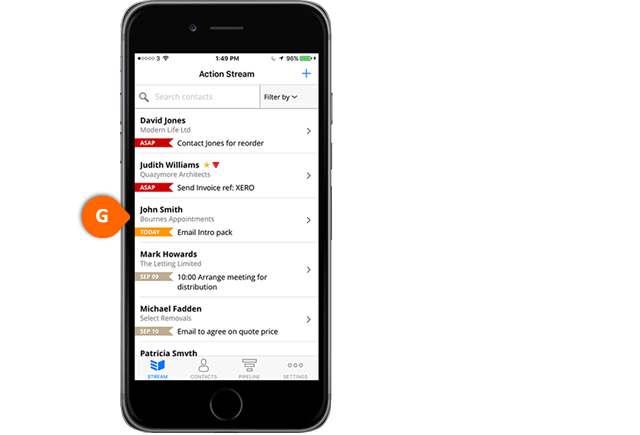 This is the next task to be completed to move your contact closer to a sale. Enter your Next Action text and schedule it for a date in the future. Select Save to save this Next Action (see F). Your contact will then appear in your Action Stream with the Next Action text and it will float to the top when the action falls due (see G).